We’re open 7 days a week including evenings and bank holidays and can offer same day treatment. 20 minutes from Manchester City Centre and open seven days a week & evenings, we offer professional, friendly & efficient ear wax removal and Audiology services across Sale, Cheshire, Trafford, Stockport and the Greater Manchester area. With twenty five years experience we offer free ear inspection and advice (no treatment, no charge) and same day treatment without the need for a GP referral. We also offer hearing assessment & hearing aid provision together with a range of customised ear & hearing protection. Excessive or impacted ear wax can cause discomfort and hearing loss. It can also interfere with the normal operation of hearing aids. Full diagnostic hearing assessment includes hearing function testing and assessment of the ear drum and middle ear. We guarantee no hard sell. You are welcome to come in and discuss your situation & needs with no obligation to purchase a hearing aid. We can offer production of custom ear products such as swimming plugs, noise protection and audio headphones. "Excellent. My daughter had a blocked ear for the best part of 6 months and had no joy sorting this using ear drops through our GP. She now has her hearing fully back after microsuction to remove the wax. Got an appointment the very next day. Dan was lovely. Talked us through everything and ensured the wax was fully removed even though some of it was deep in the ear and difficult to reach. Great experience. Highly recommended." "I was astounded how quick effective and painless the treatment was. After weeks of misery, I was so pleased with the results. Dan was friendly and immediately put me at ease with his friendly, but professional, manner. I will definitely be using this service again. 10/10!!! Will definitely be recommending him to family and friends with problems." “I had a bad ringing and hearing loss in my right ear. I gave djB Hearing a call on the Friday before Christmas. I got a appointment for 19:30 the same night! Fast and painless treatment and can hear once again. Very happy. 10/ 10”. "The treatment was quick and painless, very efficient and friendly staff, the price quoted was what I paid and would recommend this clinic to anyone." "Excellent service. Flexible appointments (including evenings). Easy parking in convenient location outside central Manchester. Phoned at 8am and received an appointment that evening. Dan was friendly and efficient." "Just to say "thanks" for seeing me yesterday - my ear's fine now and I'm no longer worried about flying tomorrow." "Excellent service & thanks so much for seeing me so quickly! I can hear again! Will definitely recommend you to family & friends, thanks again." "Dan, You have changed my life!! Thank you so much. My husband is going to book an appointment to see you in the next few days and I will arrange one for my son. Thank you once again! Best wishes." "I have worked with Dan for ten years. I have always found him professional, caring and skilled in his work, delivering quality care to his patients"
"An earwax build up was causing me some discomfort and hearing loss. I had the microsuction treatment which meant no messing around with oil etc. The treatment is very quick, painless and effective. £60 well spent. The service is great, Dan is very friendly and extremely professional. The clinic is very minimal and clean which inspires confidence and is easy to find when travelling in. The treatment was pain free and very effective." "Custom made swimming ear plugs from @djBhearing Highly recommended for deep, cold open water swimming Massive diffrence with head freeze." "Dan Butterworth was trained for micro-suction clearance and de-waxing of the ears. He was running the de-waxing clinic with his colleagues in the Audiology Department (Trafford) since January 2002." "Absolutely 100% happy was called back within an hour, Dan kind polite professional got appointment for next day, clinic spotless. would highly recommend best £60 I have ever spent, after weeks of sore blocked ears relief was instant totally painless procedure . Wouldn't hesitate to go back in the future if ever needed." "Absolutely fantastic service. Quick, personable and genuinely nice people. Would definitely recommend djB." "The results were astounding. Dan arranged an appointment for me the same evening I contacted him and the communication was excellent. I saw him the following day and was immediately put at ease. The treatment was extremely professional and quick and the results were amazing. 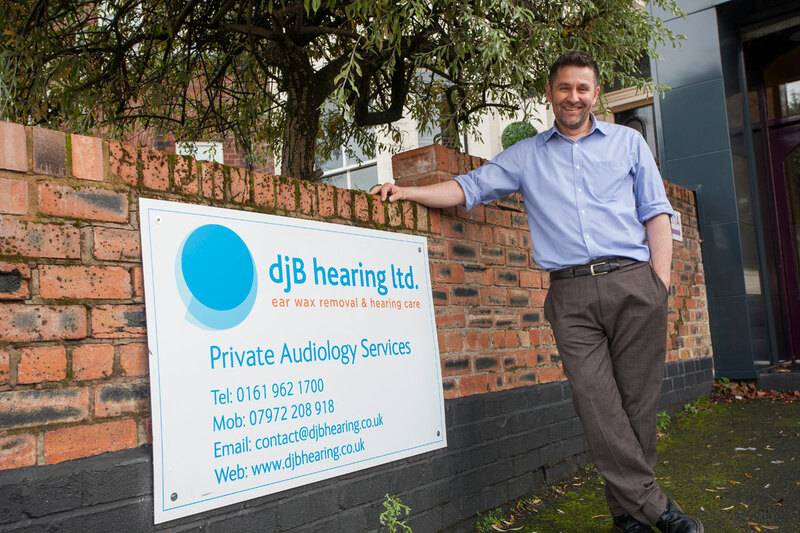 I would definitely recommend djB Hearing and will use them again if I need to." "I can't rate Dan's customer service and professionalism highly enough. My partner was in tremendous pain with a blocked ear. Dan actually gave us an appointment that day. The clinic was easy to locate and comfortable and it's clearly evident how experienced Dan is as a practitioner. We can't thank him enough and highly recommend this clinic”. "The treatment was really good. It was fast and efficient. It was a great relief to have it taken care of so quickly after being told I would have to wait for at least 2 weeks by my doctor. I rang Dan and was seen to within a few days." "I had been suffering from earache for a week. Even after 3 ear syringe appointments, I had no relief. Finally Dan helped me using micro-suction technique. Dan had been very gentle, flexible also very patient. I really appreciate the time and effort he had put in considering the hardness and quantity of the wax which was developed. A highly recommended for ear wax removal… Thanks."